Welcome to the Mary, Queen of Heaven School community. I am grateful you have found us and am excited to share a bit of information about how we are “Inspiring Hearts, Minds, and Spirits”. At MQH we provide a challenging, enriching curriculum that meets the growing needs and interests of our students. We offer an array of enrichment opportunities to balance the rigorous curriculum and classroom activities. The gifted staff, dedicated parents, and wonderful parish are what make our school distinctively different. The students and their needs are always at the forefront of every administrative decision. The spiritual development of the students is our top priority. Father Kevin Kahmann, our pastor, leads by example and encourages a positive and prayerful atmosphere on our campus. 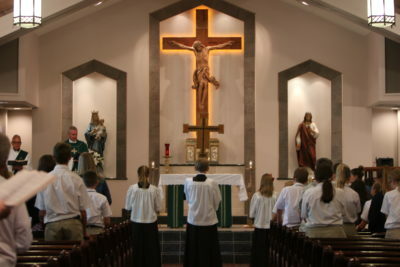 We begin and end our day in prayer, celebrate mass as a whole school twice weekly, and are constantly focusing on the traditions and values of our Catholic beliefs. God has blessed the Mary, Queen of Heaven students in an abundance of ways. Through faith, academics, leadership, service, athletics, friendships, and celebrations our community is thriving and growing. We are a small school with big opportunities! May God continue to bless our Knights and all of you!